A boy, seemingly wounded, sits quietly in a brand new, very well equipped ambulance. At a point he touches what looks like a wound on his left temple. He shows no reaction to that touch. ), from which the pic is taken, shows the boy being handed from the dark above to some person in a rescue jacket and carried into the ambulance. There he sits quietly, unattended, while several people take videos and pictures of him. One other kids, not obviously wounded, is then carried to the ambulance. 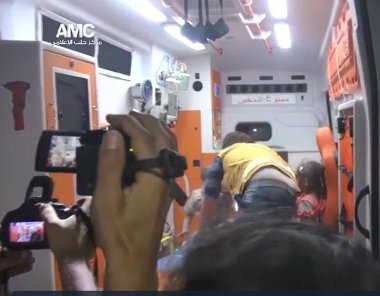 Mahmoud Raslan, a photojournalist who captured the image, told the Associated Press that emergency workers and journalists tried to help the child, identified as 5-year-old Omran Daqneesh, along with his parents and his three siblings, who are 1, 6 and 11 years old. "We were passing them from one balcony to the other," Raslan said, adding: "We sent the younger children immediately to the ambulance, but the 11-year-old girl waited for her mother to be rescued. Her ankle was pinned beneath the rubble." An internet search for "Mahmoud Raslan", the claimed "photojournalist", finds no other pictures or videos attributed to that name. There are about 15 men standing around the scene and doing nothing. (Next to a "just bombed" site in a warzone? No fear of a double-tap strike?) At least two more men, besides the videographer, are taking pictures or videos. Another kid is carried into the ambulance. In the background there is someone with a white helmet wearing a shirt of the U.S./UK financed "White Helmets" propaganda group. An animated wounded man is walked towards the ambulance. The amount of red colored substance on the boy and the man do not correspond to the amount one would expect from even a minor head wound. There are also no bandages applied or anything else that could have been used to stop an actual head wound from bleeding. 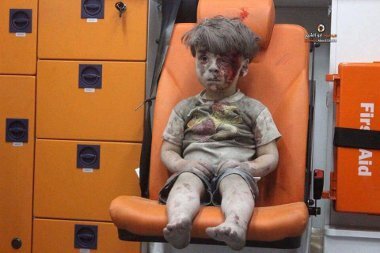 Compare the above to this recent picture from a boy in west-Aleppo. 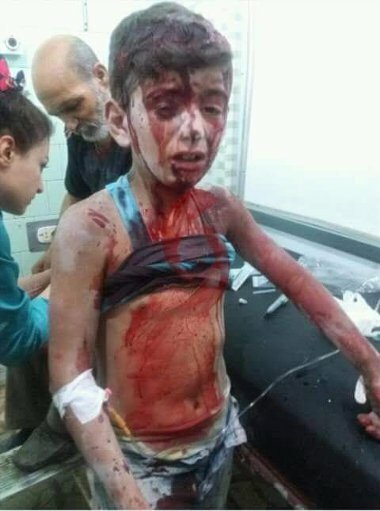 (No "western" media showed this boy and his suffering. He is not on "our side".) The boy suffered a head wound after an improvised missile from al-Qaeda and its associates hit his neighborhood. He is in care, the bleeding has been stopped. The amount of blood on his body and soaked into his cloth is a multiple of that seen in the above pictures. The blood is also mixed with the other dirt on his face, not painted over. This looks like those patients in my ambulance. This looks real. All attributes of the "boy on orange seat" scene and of the video are the same that can be found in dozens of "White Helmets" videos. It is the same theme that occurs over and over again in our picture collection Dramatic Rescue! Man With Kid Runs Towards Camera!. 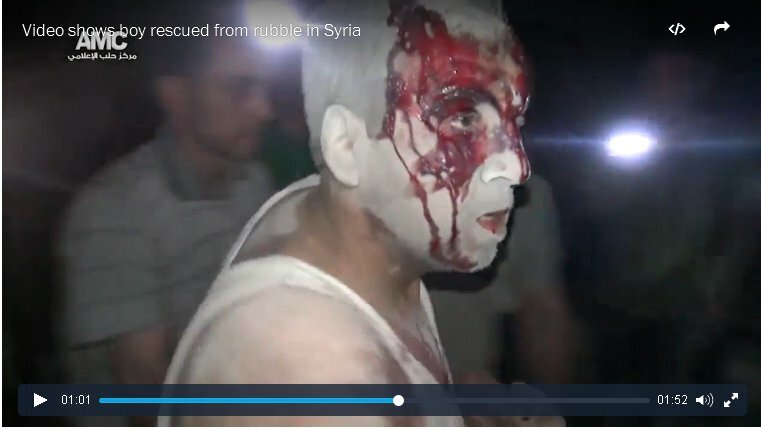 I am inclined to believe that the video above is just as staged as the other "White Helmets" videos and pictures. The look of the boy's wound is a bit more realistic than usual but the lack of bleeding, that no one attends to the boy, his non-reaction to touching the "wound" and the general setting of the video scene lets me believe that it is staged. This new, widely distributed propaganda item comes again at a moment where al-Qaeda and its associates in Syria are in trouble. The Russian air force is hitting them in the rear area of their attack on west-Aleppo and it is hurting them badly. A "humanitarian ceasefire", which can then be used to reorganize and resupply, is urgently needed. The propaganda helps to increase the pressure for such a demand. 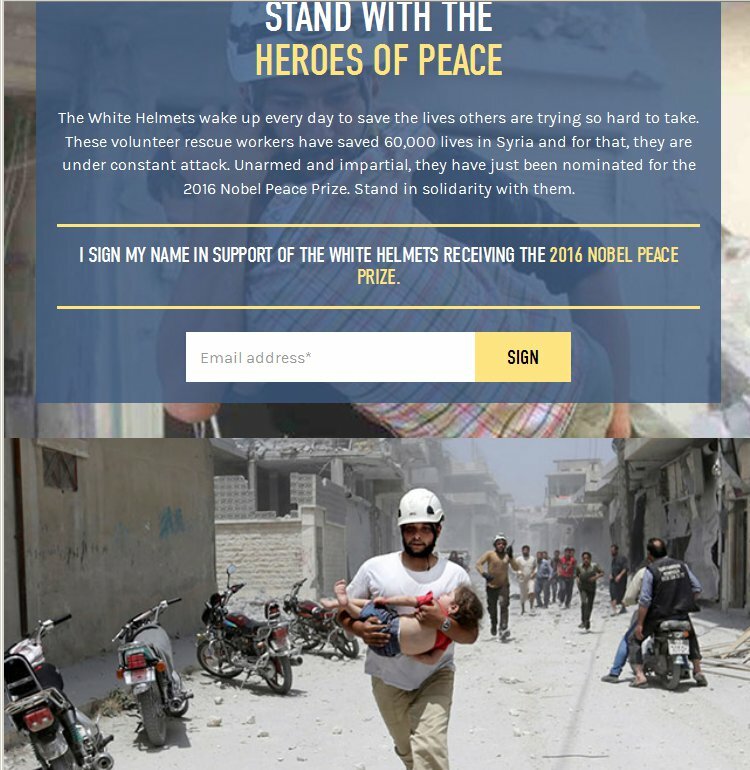 Some of its sponsors want the "White Helmets" nominated for the Nobel Peace Prize. The organization itself lobbies for it on its website. Has anyone else ever done such? Have they no shame asking themselves for the prize? This right above another version of their main corporate brand attribute, a "Dramatic Rescue! Man With Kid Runs Towards Camera!" picture. Asking for a Nobel right above another staged scene? But why not? Obama was nothing more than a marketed product when was handed the Peace Nobel. He then bombed people in seven Muslim dominated countries to dust. There is no good reason then to not give that prize to yet another propaganda tool which also wants more war. Then again, I find a nomination for the Academy Awards, maybe in the category of "Best Marketed Fakes", more appropriate. Fascinating. When I saw the original photo, the soot across the right eye looked like it had been painted on as the lines were just too straight. It should be remembered that the "photojournalists" of the "rebellion" got their training and equipment from the CIA. I do think that instead of the a Noble Peace, they should get an Oscar for Best Fake Reporting. But think of all the effort they put into these photos, b. The casting alone is impressive. Military-age men without (or with neatly trimmed) beards. 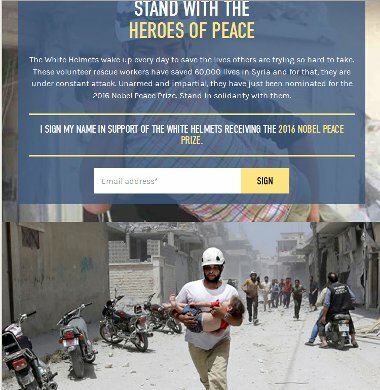 Soros demanded they stop publishing any White Helmet photos with guys that have long, scraggly head-chopper beards, and suddenly you didn't see any. And I mean zero. That was around the time the U.S. told the FSA to trim their head-chopper beards because the long ones scared Americans. No TOW-2As unless they shaved. The MSM started publishing photos with groups of head-choppers - all either clean-shaven or with equally-neatly trimmed beards. It was just weird. I don't think al Nusra liked that too much, so it sort of disappeared. The White Helmets have dutifully kept publicly-released photos of themselves restricted to rescuers clean-shaven or with short-trimmed beards. It makes them look less head-chopper-ish and - I guess - Nobel Prize worthy. As an aside, I love how the kid in the impossibly-clean orange/white 'ambulance' is sitting next to a well-labeled First Aid kit. Because you want to be sure your medical supplies are labeled in English - the national language of Syria. It's also important to have a First Aid kit in an ambulance because you never know when you'll have a medical emergency, and where would you get any medical supplies then? As a scenic in Hollywood I work on many productions after the chippers (carpenters) do their thing. I am usually on set when they do the shoot for minor touch ups so I see a lot of this type of thing for tv and movie productions, where it may be appropriate. This is a piss poor production job if I have ever seen one. Niall @18 The White Helmets were created by the British MI6/Military as a propaganda organisation. Some of them are terrorists. Here is a video of them mixing with the ISIS and FSA buddies. There are other videos of them celebrating ISIS victories and bragging about dumping the bodies of non-takfiris in the trash. just like that Syrian Observatory for Human Rights run by a one man show who some say is an Arab MI5 Operative who spews propaganda for the Terrorist Rebels.